Researchers have discovered a way to keep bacteria-killing viruses alive for weeks; when placed in wound dressings, they can kill bacteria that try to infect patients. 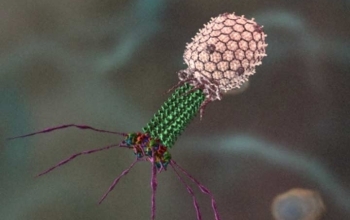 Bacteria-killing viruses, or bacteriophages, attack bacteria in the same way as the creatures in the movie Aliens. The virus invades a bacterium, uses it as a material to create copies of itself, and then explode outward to infect other bacteria. Researchers at the University of Strathclyde in Scotland have found a way to bind these ordinarily short-lived viruses to polymer microbeads. The microbeads can be built into sutures and wound dressings, and kept alive there and active for up to three weeks. Once inplanted in a patient, the bacteriophages look for harmful bacteria like MRSA (methicillin-resistant Staphlococcus aureus), much-feared bacterium that is proving very difficult to treat with traditional antibiotics. 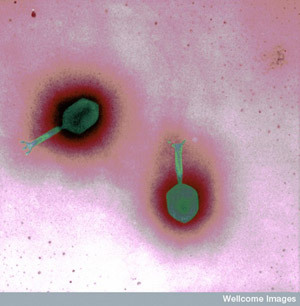 The bacteriophage viruses attack the superbugs, and kill them Alien-style. The bacteriophages are not harmful to human beings. In the graphic example shown above, the structure of the bacteriophage T4 is derived from three-dimensional cryo-electron microscopy reconstructions of the baseplate, tail sheath and head capsid, as well as from crystallographic analyses of various phage components. The prototype bacteriophage devices for detection and decontamination have been shown to clear MRSA infected surfaces such as tiles and cotton, with the bacteriophages successfully killing 96% of the MRSA strains isolated from patients in three different hospitals in the UK and USA. From University of Strathclyde, Glasgow, Scotland via Medgadget.